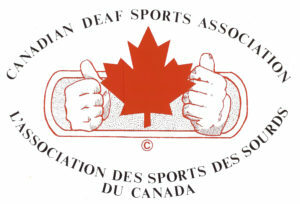 The Canadian Deaf Sports Association (ASSC-CDSA) was founded in 1959 as the Canadian Deaf-Mute Sports Federation. In 1964, it was incorporated under the name of the Federation of Silent Sports of Canada Inc. The organization once again changed its name to the Canadian Deaf Sports Association and now operates as a non-profit. Below is the CDSA logo and how it changed over the years.